Of all of these, friction and air resistance are the most well known and discussed online. These are the easiest to get right with just your intuition. But what about potential energy? Don’t all the cars have the same potential energy if they weight the same amount and are placed on the track at the same height? The answer is no! The amount of potential energy is determined by how far back your car’s center of mass is located. The center of mass is the point at which your car will balance (say on a pencil). If your car’s center of mass is located toward the front or middle of the car, you are missing out on potential energy. Potential energy is the “gas” your pinewood derby car runs on, so fill it up as much as you can. 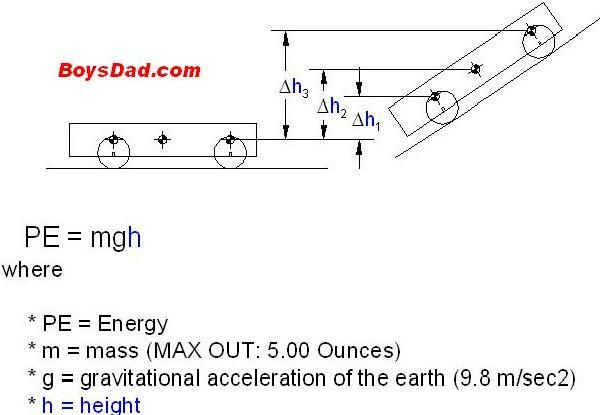 See the potential energy diagram to see the difference. Can you explain the diagram? if I read this diagram correctly, best weight placement is center of vehicle and directly over front and rear axles? You always want the weight as far back as you can put it without causing the car to “wheelie” when the track levels out. My son and I just finish shaping his first, derby car, what a great experience. I thought scouting would be fun, but it is so much more than that. It is one the few placing left that it is okay to be a guy. so if my center of mass is near the middle of the car where am I missing out on potential energy? From the diagram, if you move the weight from the center toward the back of the car, you can increase the distance the weight falls by up to 1.41 inches (0.036 meters). This corresponds to an energy gain of 0.05 joules (.14175 kilograms * 9.8 meters/second squared * .036 meters = 0.050 joules). It’s not a lot (the whole car has a maximum of about 1.6 joules), but the winning cars are usually really close. We are making your Luthor car. Where do you suggest to put the weights? The center of gravity is 2″ in front of the back axle. How close do you put the weight. I have not weighed it yet to know how much weight to add. On the Luthor car, I would put the weight (probably about two holes, 3/8 diameter, filled with lead) between the current center of gravity and the rear wheel. Be careful not to cut too close to the wheel notch or it will split. I am making the Fonz and am wondering where I should be putting the weight? If I am understanding, center and rear. Nothing has been done to the car yet. ready to attach weights can be found at Hobby lobby or your local boy scout shop. the easiest ones are a one piece with many rectangular pieces about the width of the car. You can glue them to the bottom or attach with small screws. Or if you have lead fishing weights they will work too – but you may have to 1 drill holes in the car, 2 then melt the lead and pour it in. DOnt forget lead is toxic…so be careful. center of gravity – balance the car until you find a point near the middle….where the car will balance on your finger…you want to place the weights behind that point. Don’t forget to reduce friction by sanding your nail axels and adding graphite too. I have had good sucess with a center of mass (COM) about 1″ to 1 1/4″ in front of the rear axle slot. If your track is smooth, place it at 1″. The rougher the track, the farther forward you’ll want it. A good way to find COM is to balance it on the edge of a ruler. You’ll have to let go only briefly, and be ready to catch it before the wheels hit the table. 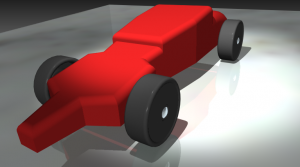 Hi, any suggestions on weight placement on the Bond car? Thank you. I love it!! I got a C in physics so I am definitely not the guy to talk to. Maybe a C-. We have a track that does not have a curve that I have seen some pictured with, and ours levels out after the finish line- what would you suggest? Going with the above it might be best to weight a car at the far back and as high as possible?